I usually don’t include the Office of Readings to start the day (I’m not obliged to do so), but I chose to this morning, and boy was I surprised! I picked a heck of a day to start. Reports of your splendid character have reached me: how you are beyond reproach and ever unshaken in your patient endurance – qualities that you have not acquired but are yours by nature. My informant was your own bishop Polybius, who by the will of God and Jesus Christ visited me here in Smyrna. He so fully entered into my joy at being in chains for Christ that I came to see your whole community embodied in him. Moreover, when I learned from him of your God-given kindliness toward me, I broke out in words of praise for God. It is on him, I discovered, that you pattern your lives. On Thursday, July 21, I will give a presentation in Holy Family Church’s free “Theology on the Lawn” series, titled “God’s Voice in the Daily Life“. I will focus on discerning God’s voice in the big and little moments and events in our daily lives. I will share personal examples and inspire reflection on such moments in your own life. This talk is intended for all ages, at all stages of openness to God in one’s life. Theology on the Lawn: A free series of talks on faith topics, Thursday evenings this summer at Holy Family Church in Granite City. Talks begin at 7 P.M. in Mary’s Garden at 2300 Sheridan. In case of rain, we’ll meet in the adjacent Conference Center. Talks last 20-30 minutes, followed by fellowship & free snacks. Bring the family, bring friends and neighbors… just bring your own lawn chair! With prayer and thanksgiving for all of those who gave the ultimate sacrifice of their lives in service of our country. This weekend is a diaconate formation weekend for my classmates and me. We’ll be studying “Prayer & Sacramental Participation”. I’m going to try to remember to share when I’m away on these weekends, and ask you, in the charity of your own prayers, to please lift my classmates and me up in your prayers during these formation weekends. In turn, I will be remembering you and keeping your intentions in prayer during our Holy Hour on the Friday night of the weekends. If there’s a particular intention you’d like me to keep in prayer, please comment with it here or message it to me privately. As I’ve gotten back into the habit of praying the rosary each day (a habit I never should’ve gotten out of, but that’s a different story), I’ve developed a “standard” of the intentions that I keep top-of-mind and place before Mary and Jesus during each of the five mysteries. They’ve come to mean a lot to me and to aid in directing some of my reflections and thoughts as I pray (beyond just the meditation on the subject of each mystery), so I thought it might be worthwhile to share them here. If you’re looking for ideas for intentions as you pray the rosary, perhaps you might find some thoughts, ideas, or inspiration here. As I reflect upon the first mystery, I also hold especially in my mind the health, well-being, and intentions of my own bishop, Thomas John Paprocki, and of Pope Francis and all bishops. This one holds a special prayer in my heart, because this structured way of approaching my prayer intentions with my rosary developed when our pastor asked my mother-in-law, when he was blessing a new rosary as a gift for me, to ask me to pray the first Hail Mary of the rosary for him. As a result, I always remember him, all priests who have served my parish and city, and all priests (especially those I know personally) in mind during the second mystery. I always remember my pastor, Father Jeff, in a special way during the first Hail Mary, but then immediately broaden my prayer to cover all of the priests and seminarians who come to mind. As I pray the third mystery, I am mindful of and pray for the intentions of all deacons, and my brothers in formation for the diaconate. I pray for our service among God’s people in the world. I also take a moment to pray for all religious, especially the religious sisters who have served in our parish and school. During the fourth mystery, I turn my prayer toward my wife Suzanne, my four sons, our parents, and our whole extended family. At any point in time, if you’ve recently asked me to hold a personal intention in my prayers, it’s in front of my on a slip of paper as I pray the fifth mystery. As I come close to ending the rosary, this also helps to turn my thoughts outward from the authority and structure that help to solidify and support my faith life, and outward toward the world where our prayer and action are needed. If you have a special way that you structure your mindfulness of the intentions you’re laying before Mary and Jesus as you pray the rosary, I’d love to hear about it in the comments here. If you have a special intention that you would like me to remember as I pray the rosary, particularly the fifth mystery, please feel free to send me a message and I’d be glad to add your intention to my personal notes and list. 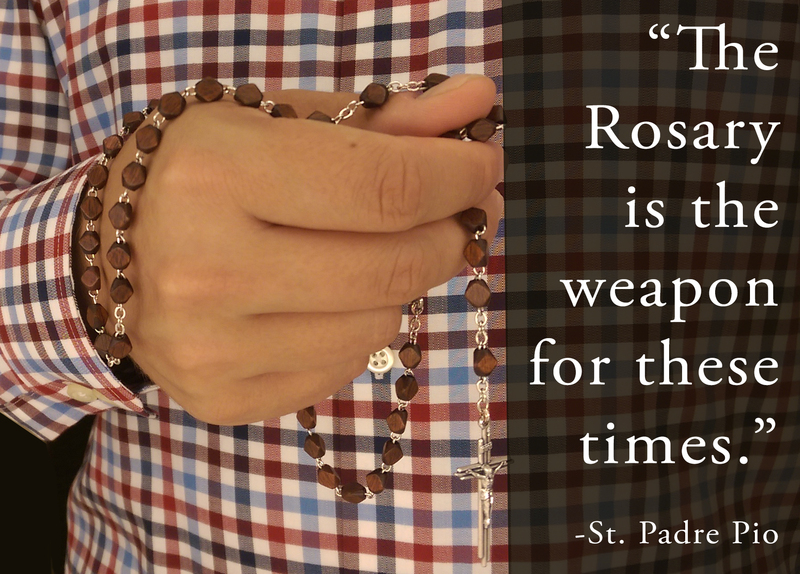 Many non-Catholics (and many Catholics) misunderstand it, unfortunately – they see the Rosary as a prayer to Mary and a stumbling block to prayer to Christ Himself and a relationship with Him. However, to me (and to Catholics everywhere), the Rosary is Jesus’s mother’s preferred prayer tool for us to use to recall the major events of Christ’s love and ministry, and pray through her, begging for her intercession before Christ her Son on our behalf.